Now that Vin Suprynowicz’s new novel, The Miskatonic Manuscript is out, the reviews are coming in. Click the names to read the entire reviews. This isn’t just a story of fighting drug warriors (though that, too). When something goes awry between dimensions and a rescue operation is needed, The Miskatonic Manuscript rapidly expands to encompass even more inter-dimensional travel, dinosaurs, nekkid women, .50 BMGs and RPGs, entheogenic drugs, and … well, you should really read to find out. “The Miskatonic Manuscript,” novel, available for the first time today, picks up where last year’s “The Testament of James” left off. The book dares to imagine a world in which New England horror writer H.P. Lovecraft’s work was as much science as it was fiction and in which someone is actually fighting back in the War on Drugs. Think of it as Robert A. Heinlein meets Jules Verne and Carlos Castaneda. And now things start to get weird—very weird—Lovecraft weird. A mysterious gadget arrives with instructions to plug it into a computer. Impossible crimes. Glowing orbs. Secret laboratories. Native American shamans. Vortices. Big hungry things with sharp teeth. Matthew and Chantal find themselves on an adventure as risky and lurid as those on the Golden Age pulp science fiction shelves of the bookstore. One key question posed in The Miskatonic Manuscript is: “What if you fought a War on Drugs, and someone fought back?” The answer is laid out in a style tactically reminiscent both of Suprynowicz’s own The Black Arrow and Bill Brannon’s Let Us Prey. Those segments, and the careful explanation of the rationale, are worth the price of this book all by themselves. At some point in the probably not-too-distant future, I expect — and hope — they’ll be cited as prescient. Anyone interested in the war on drugs and in psychedelic drugs will likely find the book interesting. The book moves along at a good clip, and Suprynowicz is interested in many of the same topics as I am and seems to know a lot. My own review will be coming eventually. The Miskatonic Manuscript On Sale! 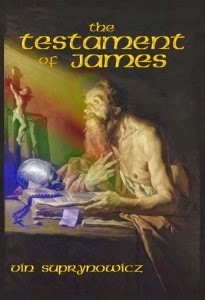 The sequel to The Testament of James is on its way! I’ve read an early draft and the final proof. You’ll like this. It’s fun. I’ll write a full review soon. Disclosure: I did some graphic design work for both novels. Informed informers inform me that Vin Suprynowicz‘ new novel The Miskatonic Manuscript should be available in about a month. I hope you’ve set your cash aside already. * Disclosure: I did some graphic design work on Miskatonic as well as Testament. ** Apparently some people took the cover art of Testament to indicate that it is a religious tract*** of some sort. Some people should have read the book description and reviews. It ain’t. *** We’re hoping that no one will mistake the cover of Miskatonic for religious reading material. Except, perhaps, members of the Church of Cthulhu. What if Rhode Island horror writer H.P. Lovecraft didn’t just imagine the “resonator” in his 1920 short story “From Beyond”? What if Henry Annesley actually built the machine that allowed him to see into the Sixth Dimension -– and allowed creatures from The Other Side to invade us here? Facing Draconian prison sentences, their Cthulhian Church banned by the federal drug warriors for employing holy sacraments that actually work, Windsor and Worthington Annesley turn to a desperate search for their great-uncle’s resonator, hoping it may be the game-changer they need. I’ve read an early draft. It’s a logical follow-on in the series (but works well as a stand-alone novel, too), but is very, very… different from The Testament of James. I liked it. You’ll like it. That’s good news. Just $5.99. And there are still signed hard bound editions available. Same great story, in a high quality, fully cloth bound and foil stamped collectible package. With a nice [grin]* Matthias Stom-based dust jacket. Get yours while they last; it’s a limited printed, 650 copies total, I believe. * I may be slightly biased, but I liked the draft Vin sent so much that I really wanted to be part of the project, even in a small way.